Make plans now to start the new year with fun Alaskan adventure. Sailing Inc. offers a full season of classes, from the Beginners classes to Advanced Coastal Cruising, from May through September. Courses and descriptions/dates (including prices) are below. We are reserving spaces now. Call (907) 224-3160 or email us to reserve your spot today. Who knows -- this might just change your whole life! Sometimes dreams really do come true. 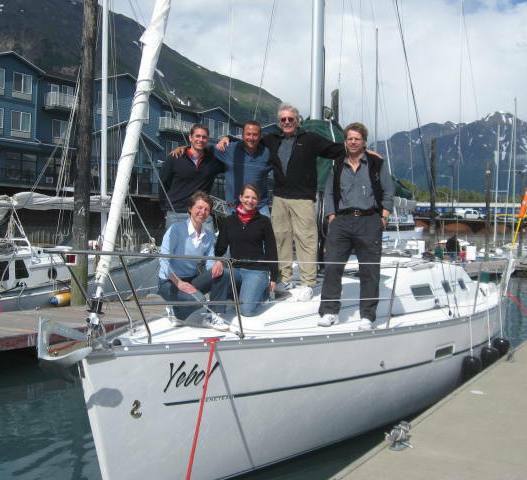 Learn to sail during 4 days of intensive sailing instruction in Seward. Includes classroom instruction from 9:00 - 12:00 in the morning, and on-the-water instruction from 1:00 - 6:00 p.m.. First 3 days certifies students to ASA's Basic Sailing standards & includes breakfast and lunch during those days. 4th day covers Basic Coastal Cruising and students will be asked to provide their own sack lunch. An intermediate cruising standard that prepares students to bareboat charter. Students act as skipper & crew sailing by day & anchoring at night. Class covers boat systems, maintenance, meals, cruise preparation and more. Prerequisite: Basic Sailing & Basic Coastal Cruising. Students will be assigned meals to prepare. Combine the Learn to Sail Package with a live aboard experience. Class includes on-the-water & classroom training for the first three days, and live aboard away from the harbor for the final three days. Students receive ASA certification for Basic Sailing, Basic Coastal Cruising & Bareboat Chartering. Breakfast & lunch is included first 3 days of class, students will be assigned meals to prepare last 3 days of class. Classroom instruction which teaches the navigational theory required to safely navigate a vessel in coastal or inland waters. Emphasizes nighttime sailing, navigation, safety, heavy weather, man-overboard, emergency procedures, blue water cruise preparation, electronics, etc. Students act as skipper & crew. Prerequisites: Basic Sailing (101), Basic Coastal Cruising (103), Coastal Navigation (105 & Bareboat Chartering (104).